The report further says that depending on the outcome of talks, leaders of AIADMK are likely to join hand with the National Democratic Alliance (NDA) government. 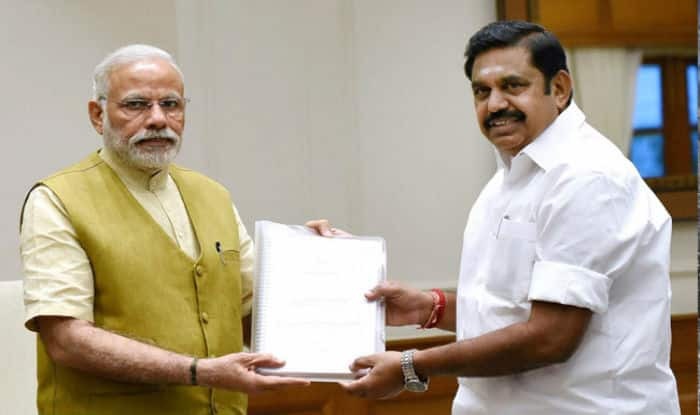 Chennai, August 1: The Bharatiya Janata Party (BJP) has started its initial level talks with leaders of All India Anna Dravida Munnetra Kazhagam (AIADMK) as part of its mission to grow its base in southern India. The report appears almost a week after the BJP government led by Prime Minister Narendra Modi were successfull in forming a government in Bihar with the help of Janata Dal (United) leader and state Chief Minister Nitish Kumar. Some reports also suggest that the much-discussed Union Cabinet reshuffle is said to be linked to the AIADMK joining the NDA camp. India Today cited an unidentified a source who said that top BJP leaders are in talks with AIDMK leadership. The report further said that a top Cabinet minister in the Centre is trying to mediate with both factions of the AIADMK – E Palanisamy and O Panneerselvam. The Deccan Chronicle reported that the timing of the talks assumes significance as PM Modfi is going to exmand his Cabinet later this month and there are chances that if AIADMK joins NDA then they may get a Cabinet berth. Some reports also say that members of JD(U) too may join the council of ministers. On Tuesday afternoon, Tamil Nady Chief Minister E Palaniswami has called for an MLA meeting at the AIADMK headquarters. For last few days, both EPS and the OPS faction within the AIADMK has been trying to put up a united stand. The AIADMK has been in and out of the NDA government in the past. The party had formed an alliance in 1998-1999 and then again in 2004-2006. BJP which has a small vote share in Tamil Nadu has been trying hard to increase its foothold in the state. Some reports suggest that multiple factions within the AIADMK had made it tough for the BJP to negotiate politically with their leadership. If both EPS-OPS faction come together, it will be easier for the AIADMK to enter NDA. After the death opf Jayalalithaa, both the factions have been fighting since last few months. On the other hand, VK Sasikala is in jail.